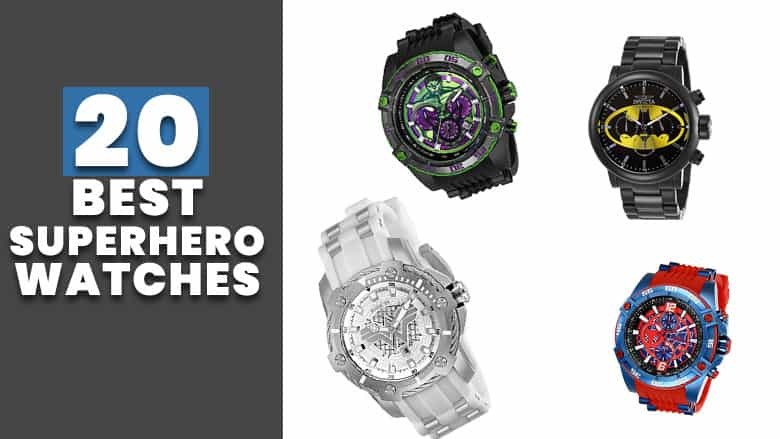 20 Best Superhero Watches for Adults (2019) | Nerd Much? Ok, so that last part might be a bit exaggerated, but it’s no secret that cool superhero watches can both tie an outfit together and help show off your nerdy passions in a low-key, subtle way. 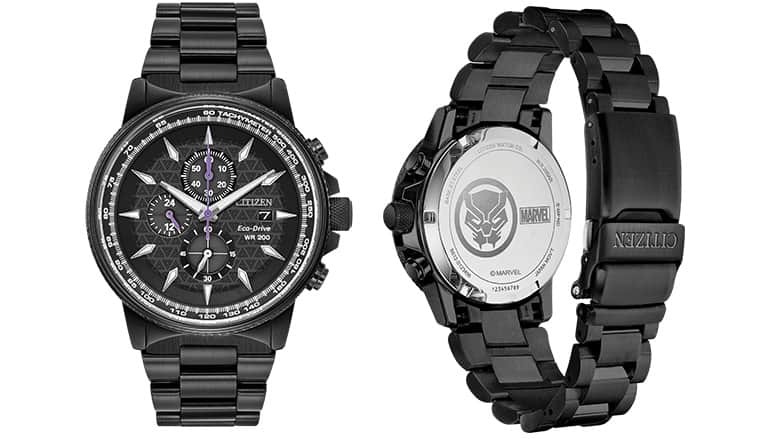 And for fans of the ever-popular superhero genre, there are so many superhero watches – even for adults! Available in a wide range of styles, the 20 watches represent the best money can buy when it comes to superhero accessories. From handcrafted Swiss-made, ultra quality luxury superhero watches to more everyday timepiece options, this list is sure to have something for every superhero fan. Whether you prefer Marvel or DC, Batman or Spider-Man, retro or modern, or any other choice in between, there is no shortage of options. For fans of the world’s greatest billionaire detective, this limited edition Invicta Batman Watch is the watch you need (and also the watch you deserve!). With a classic design featuring the Caped Crusader’s iconic logo itself on the watch face, this beautiful timepiece looks like it could have been designed by Lucius Fox himself (additional crime-fighting features not included, however). Never get caught prowling the streets of Gotham without this necessary accessory to guide the way. With a pitch-black, stainless steel body and watch band, this piece is a durable and fashionable accessory that is sure to make a great addition to any wardrobe (super suit or otherwise). At a reasonable price of only about $250, it is also one of the more reasonably priced items on this list, meaning you can enjoy all the luxury of a professionally-made, stylish watch without breaking the bank. A great option for any fans of the Dark Knight. From luxury watch brand Citizen comes this beautiful tribute to Marvel’s Golden and Silver ages. Featuring a watch face adorned with retro comic book art of fan favorites such as Captain America and Spider-Man, the Citizen Marvel Heroes watch is an excellent choice for anyone looking to celebrate the roots of the superhero phenomenon that has taken over the imaginations of millions today. Featuring a blue Condura brand strap and a stainless steel body, this watch is further powered by Citizen’s trademark Eco-Drive light-activated technology, meaning that it never needs a battery to function. For fans looking for style as well as practicality and longevity, this watch is an ideal choice that will help show off your love of classic comic books while lasting for years to come. For the price, a metal watch band would be preferred, but given the lack of maintenance needed to be performed on this watch, the price is well worth it. 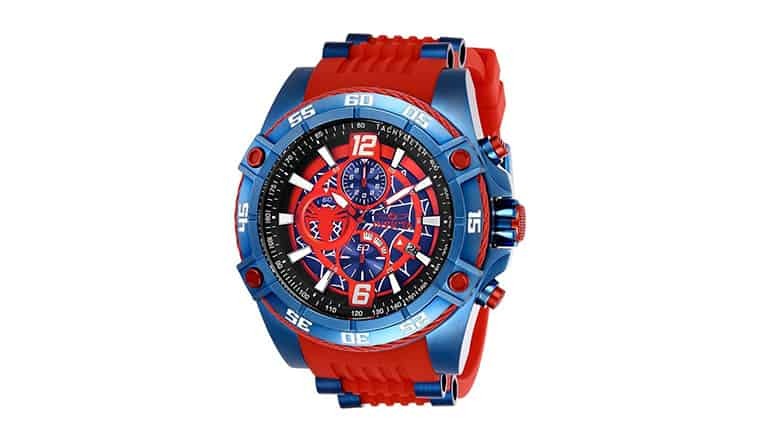 Featuring a vibrant blue-and-red color scheme with a futuristic design, this luxury superhero watch is a bold and striking choice for fans of New York City’s #1 web-slinging crime fighter. With a subtle yet distinct Spider-Man logo featured at the top of the watch face, this watch strikes a good balance between subtlety and eye-catching remarkability. With a style reminiscent of classic Silver and Bronze-era Spider-Man comic books, this watch is a particularly good option for fans of the original Spider-Man stories. Making use of Citizen’s signature Eco-Drive technology, this watch requires no battery to function, being powered solely by light exposure. Built to be water resistant up to 333 feet, this watch keeps ticking even when swimming or showering, and its silicone watch band and body make it a durable option that will stand up to even the most intense pressure. Whether you’re duking it out with the Green Goblin, or just swinging around Manhattan, this watch is a solid option that will keep on working for years to come. 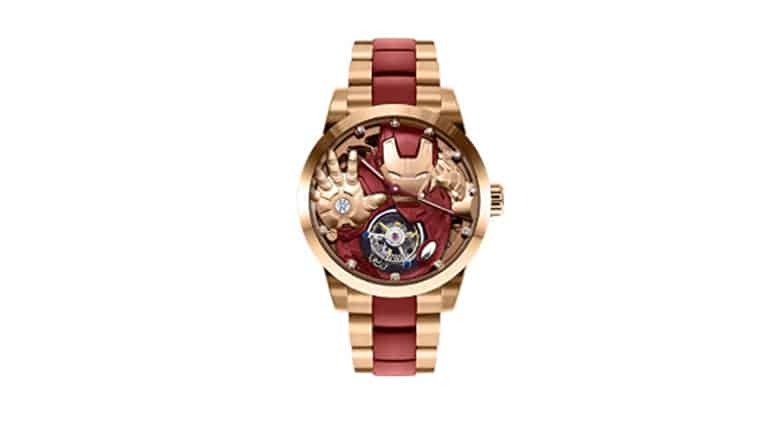 Featuring one of the best designs on this list, this limited edition Avengers Memorigin Iron Man watch is also one of the most expensive collectible superhero watches out there, coming in at a whopping $7,500. This watch is an ultra-luxury collector’s item by well-known luxury watchmaker Memorigin, and it’s for super fans with loads of disposable cash only, but despite the steep price, this watch is well worth the price tag. This Swiss-style tourbillon watch is made with the finest craftsmanship, featuring over 155 pieces of subassembly module and 18 jewels. For the serious watch enthusiast, this watch is an incredible piece with a masterful design worthy only of a billionaire like Tony Stark, who is featured on the watch face in his Iron Man super suit. As one of the few ultra-luxury pieces on this list, this watch is for serious collector’s only, and is not meant for children. Quantities are extremely limited, so those who are interested in owning this piece should act fast before they get left out. In celebration of DC’s greatest superheroine, this striking silverand white Invicta Wonder Woman watch features a unique design that is both timeless and bold. 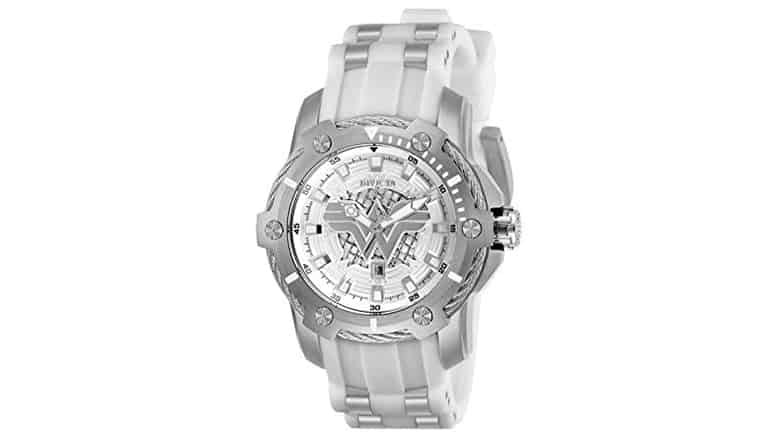 Featuring a completely silver watch band and body, this timepiece displays the Wonder Woman logo on its watch face while retaining a classic look that is appropriate for all occasions. While some may like this classic style that goes with any type of dress, others may be disappointed in the lack of a Wonder Woman-themed color scheme. Indeed, the lack of reds and golds on this watch make it feel less like a Wonder Woman-themed watch and more like a generic timepiece, but for those looking for something that will both express their love for the Amazonian warrior and fit in with any occasion, this watch is an excellent option that fits the bill at a reasonable price. 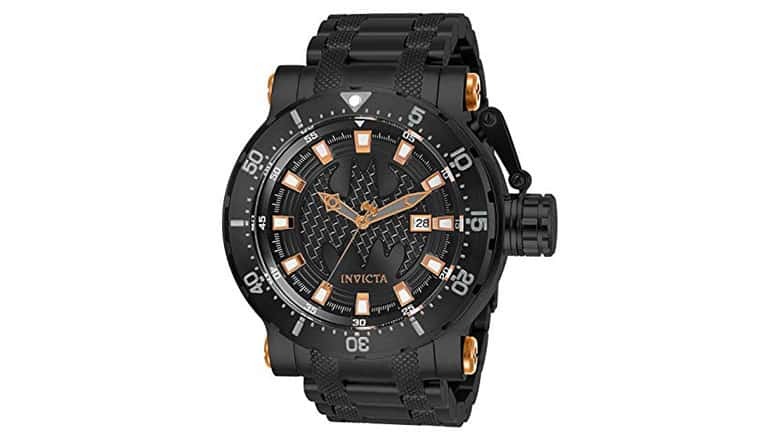 Unlike most of the Invicta watches on this list, this watch comes with a Japanese quartz movement system, a nice bonus especially when you consider the relatively cheap price of the watch. While the silicone band is also a disappointing alternative to the sturdier stainless steel of most watches, this piece is a solid option nonetheless. If the previous option didn’t pique your interest, then this alternative may just do the trick. 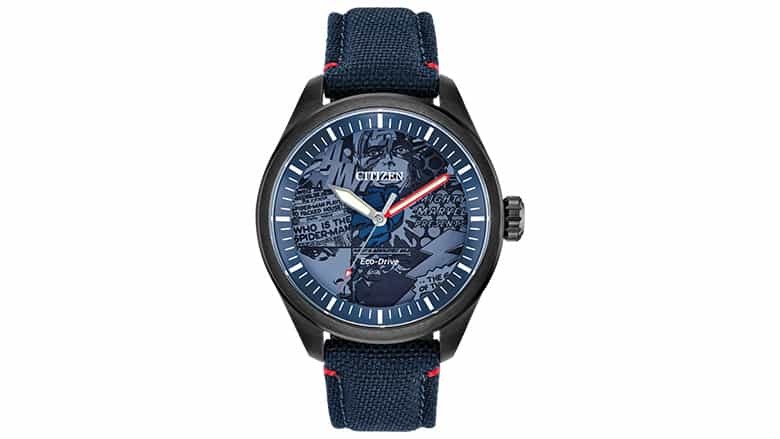 Similar to Citizen’s other Spider-Man offering, this watch features a subtle, yet distinctly Spider-Man themed red-and-blue color scheme, albeit in a noticeably more professional and high-class stainless steel watch body. In fact, this watch is so much more deluxe and professional in appearance that it’s hard to believe it barely costs more than the other option. For fans looking for something a little more striking, this watch may very well be worth the additional $45. As with most Citizen watches, this piece is powered by Eco-Drive technology, meaning it requires no battery to function. As watch battery replacements can be costly, this is certainly an attractive feature, although purists may want to hold out for something a little more traditional. The stainless steel band and body are certainly a nice addition as well, giving the watch a weight and look that make it well worth the price tag. It’s one of the best superhero watches you can buy if you’re a Spider-Man fanatic. 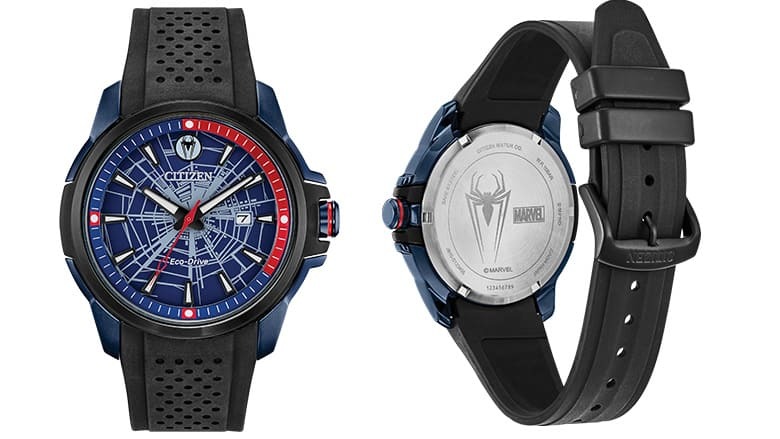 For fans of Marvel’s most patriotic superhero comes this collectible watch. Featuring a Captain America-inspired design on the watch face, this Captain America watch is a solid piece, if somewhat wanting in design. Unlike most designs of a similar price point, this watch comes with a cheap nylon watch band in a somewhat off-putting camo design. While this is not totally a dealbreaker, the design does feel a bit cheap for a supposedly luxury accessory, where a stainless steel band is typically expected. 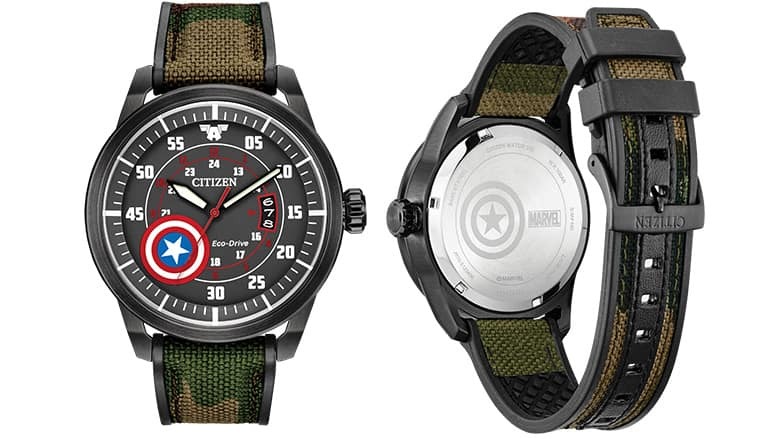 For fans of Captain America who don’t mind this minor flaw, however, this watch is a great option. Par for the course of Citizen watches, this timepiece is powered by their unique Eco-Drive solar technology, meaning no battery or complex moving components are needed to make this watch work. This watch is water resistant up to 333 feet and is appropriate for use while swimming, snorkeling, and showering. While the watch band is made of a cheap nylon material, the watch body itself is a nice stainless steel, making this a durable option for those concerned about longevity. Featuring the best in Wakandan technology, this deluxe Black Panther Citizen watch will help you channel your inner warrior. With a beautiful watch face inspired by the tribal patterns featured in the Black Panther movie, this watch is a striking yet subtle piece appropriate for any occasion, whether it be a professional function or Comic Con. With a silver and black design, this watch comes in a collectible Black Panther-inspired stainless steel box, making it a suitable option for both display and everyday wear. As with most Citizen watches, this piece features their specially designed Eco-Drive technology, which powers the watch on solar energy alone. As there are no complex moving pieces as with most ultra deluxe watches, this means this watch, along with most of Citizen’s offerings, are more durable than their counterparts. The lack of a battery that needs replacing is an additional benefit that saves on both time and money. Like the other Black Panther-inspired offering by Citizen, this watch features a design inspired by the massive hit 2018 Marvel film. Featuring a sleek and bold design that also stays timeless and classic, this Citizen Black Panther watch, while more expensive than its counterpart, is an attractive and bold accessory that more than lives up to its almost $600 price tag. With a watch face and body that more heavily emphasizes the silver color scheme of the watch, this timepiece is a striking, full-bodied luxury accessory that makes a perfect gift for fans of Black Panther. While the differences between this option and its less expensive alternative may be subtle, they are nonetheless notable, and the design of this watch is the clear winner in terms of style. This watch likewise features all of the typical benefits of Citizen watches, such as an Eco-Drive power system and water resistance up to 333 feet. While it is definitely one of the more expensive options on the list, it is also one of the nicest and most classic in terms of design, and fans who choose this option surely will not be disappointed. From Invicta comes another option for fans of one of the superhero genres most famous characters: Spider-Man. Although this Spider-Man watch is of a somewhat higher quality than the options offered by Citizen, with a stainless steel body and a moving clockwork system powering the watch, the color scheme and overall design of this option is a bit more garish, with loud reds and blues making this piece a stand out that, while powerful and colorful, may not be appropriate for more professional settings. Apart from that, the watch face design is a bit crowded. Still, for fans of Spider-Man, this well-designed watch comes at a very reasonable price, making it an attractive option for those who need to express their love for Marvel’s #1 web-slinging protector. This watch comes in a beautiful red-and-blue collector’s case, and is likewise water resistant up to 100 feet. Unlike Citizen’s watches, however, this timepiece features a moving clockwork system, and isn’t powered by a solar Eco-Drive, making it somewhat more delicate than those offerings and thus unsuitable for children. 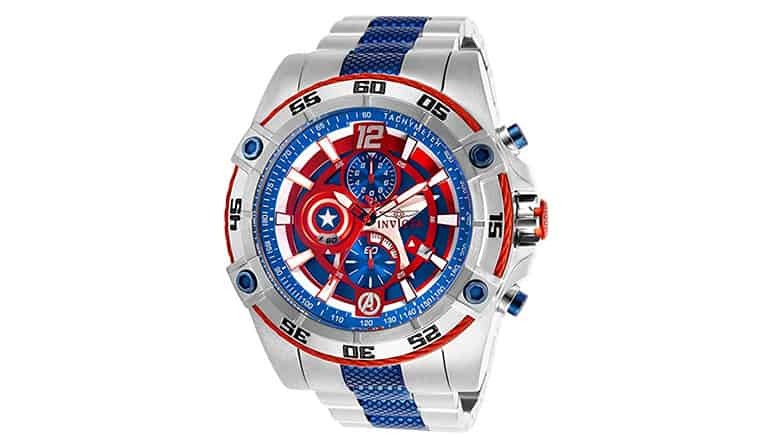 Another offering from Invicta, this Captain America watch is an exuberant and powerful accessory statement that throws subtlety out the window, much like the Captain did with Nazis back in the day. While this watch has a beautiful futuristic design, it is somewhat unsuited for Captain America, with only the Captain’s shield on the watch face giving the true inspiration of this design away. The rest of the watch’s design is more robotic, bringing to mind something like Optimus prime from the Transformers franchise rather than a superhero like Captain America. Still, this watch has an attractive design, and fans who can overlook these slight flaws should be pleased with this offering. This watch, notably, is a bit pricier than the other offerings by Invicta, being almost double the average watch of this brand. Likewise, it is not particularly durable, being water resistant only up to 100 feet or so. 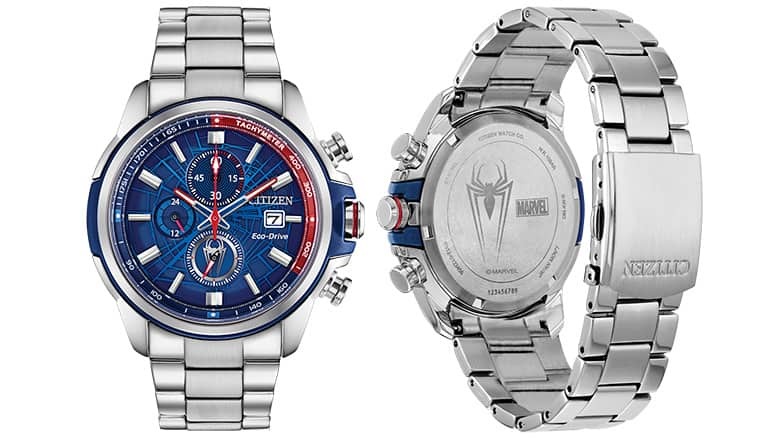 Those looking for a solid Captain America watch might be more interested in Citizen’s offerings, which tend to have more attractive designs and are certainly longer lasting than Invicta’s designs. Another watch featuring one of the biggest superhero phenomenons in recent memory, this beautiful Invicta Black Panther watch features a design inspired by T’Challa, Wakanda’s greatest hope and savior. 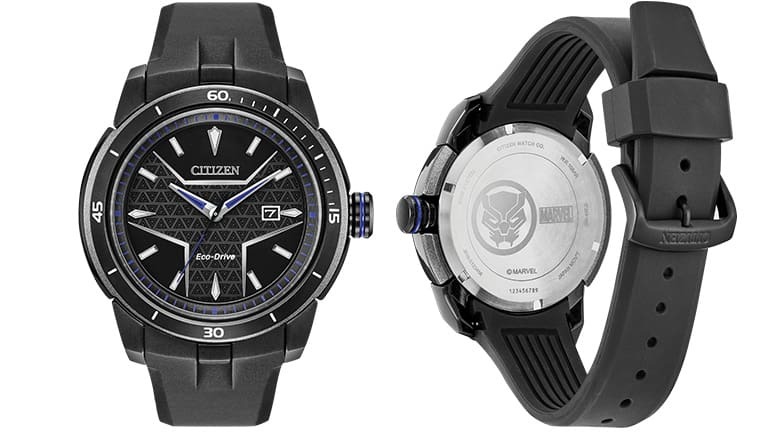 Unlike the watches offered by Citizen, however, this timepiece features a more noticeable Black Panther-inspired design, featuring T’Challa’s iconic mask on the watch face. This is a subtle yet powerful design choice that serves to both greatly emphasize the superheroic inspirations of this watch while also retaining a classic, timeless style appropriate for both business and recreational settings. 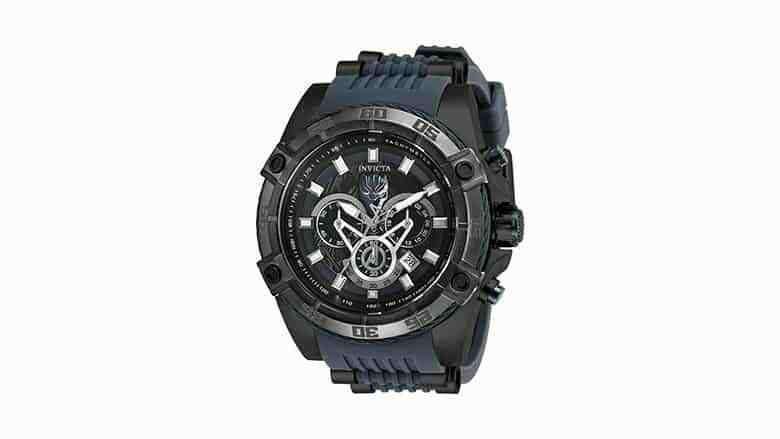 At Invicta’s reasonable price of only $253, it is certainly one of the most affordable and attractive watches on this list and a great option for anyone wishing to show their Wakandan pride. This watch, like most of Invicta’s offerings, features a moving clock work system that, while somewhat more fragile than Citizen’s solar-powered system, is a bit more sophisticated and luxurious. The watch, likewise, is water resistant up to 100 feet, and is suitable for swimming, showering, and snorkeling. The watch comes in a beautiful collector’s case as well, making it a great display item as well as a good choice for everyday wear. Whatever happened to the Man of Tomorrow? He sold the rights to his image to Invicta and they made a beautiful Superman watch inspired by his fashion sense, apparently. This timepiece is a stunning and bold accessory for any fan of Krypton’s greatest son. 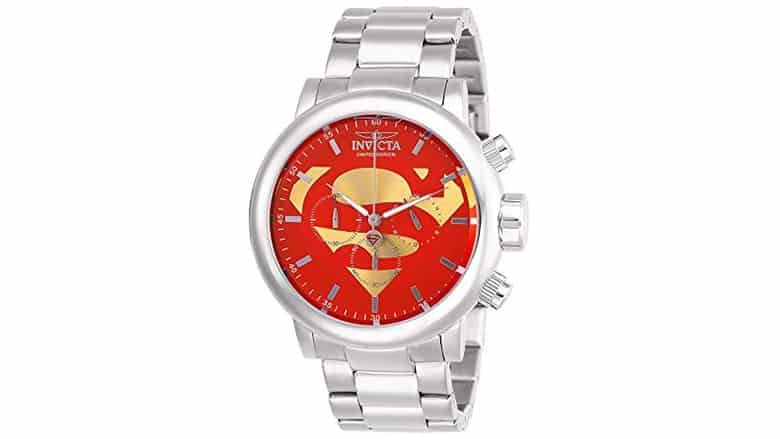 Featuring a stainless steel body overlaid with a striking watch face that features Superman’s legendary logo, this watch, much like Invicta’s Batman offering, is a timeless and classic design that shows off your love for the Man of Steel. Although a little bit more expensive than most of Invicta’s offerings, this watch is worth the extra cash for fans of the world’s greatest superhero. Water resistant up to 100 feet and featuring a moving clockwork system, this watch is a great mid-range luxury item for collectors and fans alike. This watch is set to be released in April 2019, and as quantities are limited, interested fans would be well advised to place a pre-order to ensure that their watch is reserved. For fans of Marvel’s favorite green giant comes this new Invicta Hulk watch. 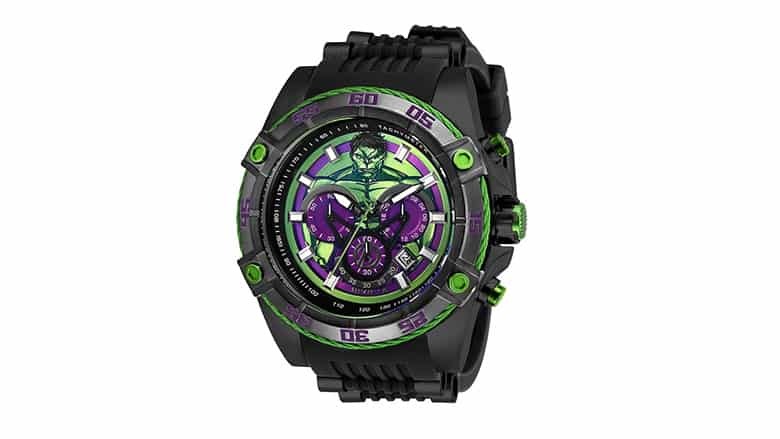 Although currently under development, this watch features a radioactive green-and-purple-and-black design inspired by Bruce Banner’s explosive alter ego. Fans who wish to purchase this watch can subscribe to a waitlist that will alert them when the watch is available to buy. As this watch is currently under development, the current design may change, which would be a relief, given the somewhat childish nature of the current design shown. While a Hulk watch is certainly something fans would clamor for, the current design available seems just a bit too childish for serious collectors and watch-wearers. This watch is expected to have similar features to Invicta’s other timepiece offerings, including a water resistance up to 100 feet and a stainless steel watch band and body. This watch is likewise expected to run on a moving clock system, rather than an electric battery, and will likely come with a similarly designed collectible box. 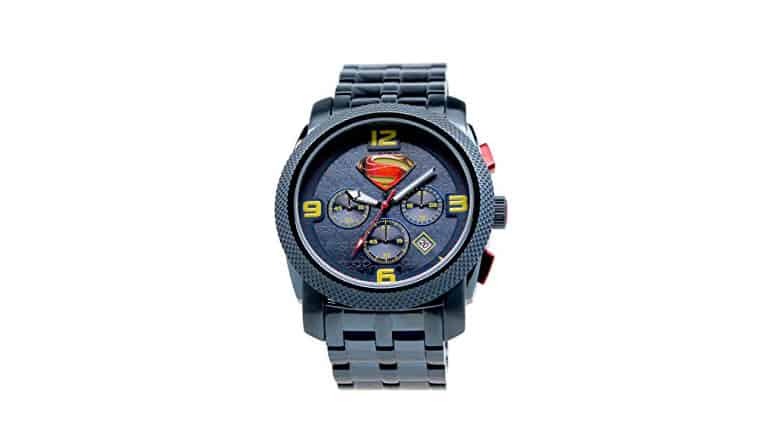 Tying in with 2013’s Superman reboot film Man of Steel, this limited edition Superman watch features a design specifically inspired by Zack Snyder’s take on the Superman mythos. Limited to just 300 watches, this timepiece is a must-have for collectors of rare superhero memorabilia. With a dark blue stainless steel design, this watch is a subtle yet distinct tribute to Superman, with a small Man of Steel logo tastefully positioned on the watch face design. With a hefty weight of approximately a half pound, this watch is a solid and durable option (and, not to mention, Kryptonite-free). Featuring a Japanese quartz chronograph movement system, this watch is a bit more sophisticated in its design than most of the watches on this list, making it a true luxury collectible item at a shockingly affordable cost for fans of the Man of Steel. While the price of this watch is very cheap for its high quality, remaining quantities are limited, so those interested in getting their hands on this piece will want to act fast before they’re all gone. As with Invicta’s other Batman offering, this Invicta Batman watch is a subtle and classic tribute to the Caped Crusader that, unlike the other watches featured on this list, makes use of a self-winding feature that makes maintenance of this watch a breeze for anyone who isn’t interested in the technical dealings of their timepieces. 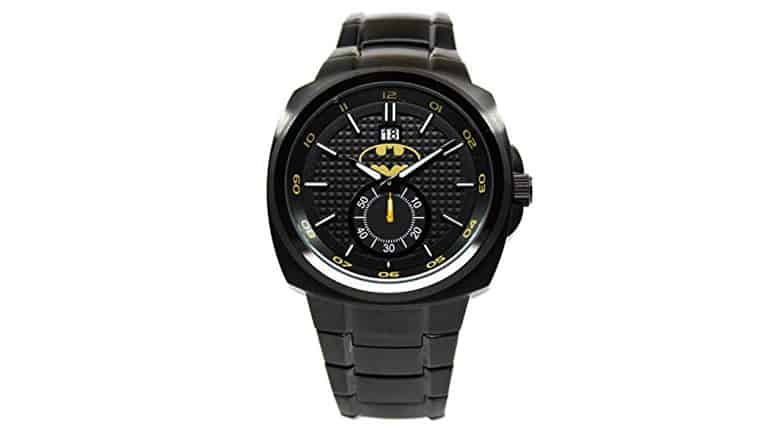 With a design that is more on the subdued side, this watch is a good choice for those looking to display their passion for Batman in a more professional setting. There are no loud colors or garish designs here, and the stainless steel watch face and body make it a solid, durable option for those looking for a good watch for everyday use. With a design that is water resistant up to approximately 330 feet, this timepiece is a solid choice for anyone who lives an active, on-the-go lifestyle. It is likewise good as a collectible display, coming in an attractive collectors box. At just over $100, it is also one of the most affordable watches on this list, making it a true luxury that any fan can enjoy. Just in time to celebrate the 75th anniversary of Bob Kane’s greatest creation comes this beautiful limited edition watch. 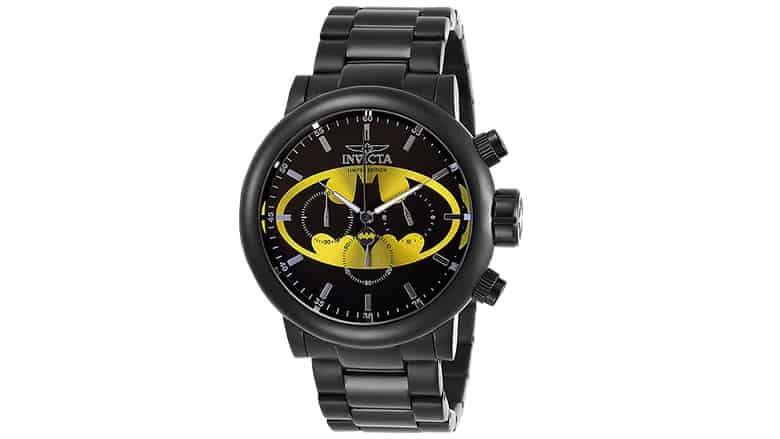 Like the Invicta and Citizen timepieces before it, this watch features a Batman-inspired design, with the infamous Bat symbol adorning the watch face for all to see. Limited to a very short run of only 500 total watches, this watch is a necessary part of any Batman collection. However, while the watch has an attractive design, it is not quite as sturdy as the stainless steel offerings by Citizen and Invicta, featuring a silicone watch band that, despite this item’s status as a limited edition collector’s item, feels a little cheap. This watch comes with a certificate of authenticity verifying that it is one of the limited 500. This watch is water resistant up to 5 ATM and further comes in a beautiful collector’s box for display purposes. As one of the cheaper items on this list, this collectible is well worth snatching up for any big Batman fans out there. 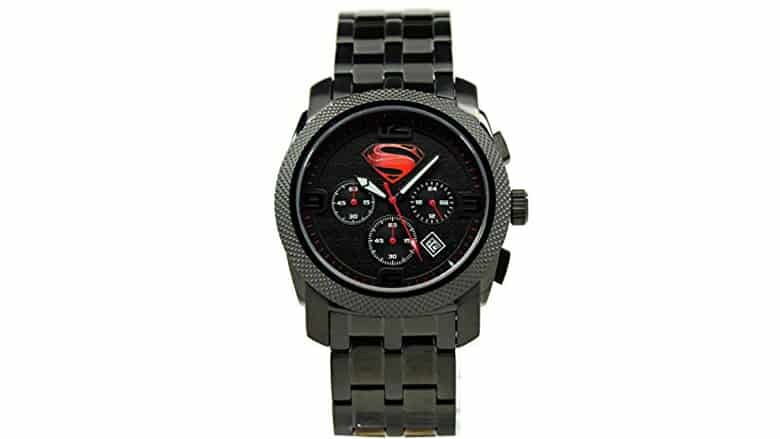 Like the other Man of Steel-inspired watch featured on this list, this Superman watch is specifically crafted and designed in tribute of Zack Snyder’s 2013 Superman reboot film. Employing a design meant to evoke the darker tone of this film, this watch features a black and dark blue color scheme, along with a subtle watch face design featuring Superman’s slightly redesigned logo, that shows everyone you mean business when it comes to superhero paraphernalia. This watch is limited to a very small batch of only 100 total pieces, and each purchase comes with a certificate of authenticity verifying the legitimacy of the piece. For collector’s interested in Superman-related accessories, particularly those of the newer Superman franchise, this watch is a must-have collector’s item that, thankfully, is available for a reasonable price. Watch uses a Japanese quartz chronograph system, meaning its design is of slightly higher quality than most of the watches on this list, and it is water resistant for up to 50 meters, making it a suitable option for swimming and showering. 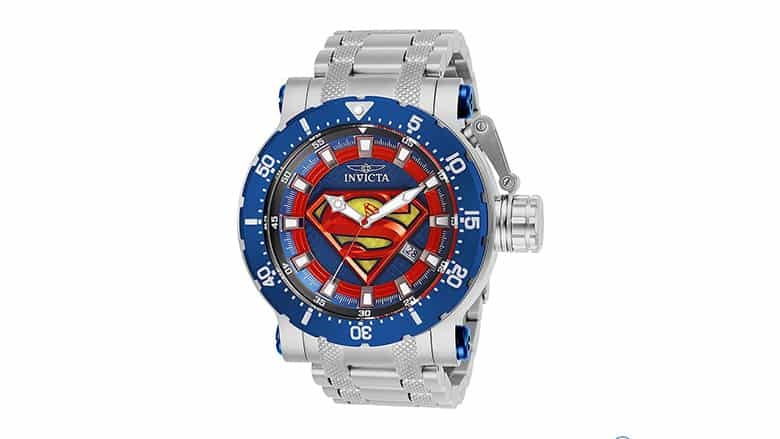 While there is certainly no lack of Superman themed watches on this list, this Invicta Superman watch certainly takes the cake when it comes to both quality and design. Featuring a timeless, classic stainless steel design, this watch has Superman’s iconic logo stretched across the watch face in a way that is both eye-catching and unobtrusive. This watch feels like something right out of the Golden Age of Comic Books, a timepiece fit for a reporter at The Daily Planet with a predilection for ducking into phone booths at the first sign of trouble. With a Japanese quartz movement system and a stainless steel body, this watch is by far one of the highest quality pieces available on this list, not to mention one of the cheapest, too. In terms of both quality and value, this watch by Invicta cannot be beat (much like the Man of Steel himself), and for those looking for a Superman-themed watch to spice up their wardrobe while still remained dignified, look no further, as you have found your heart’s kryptonite. 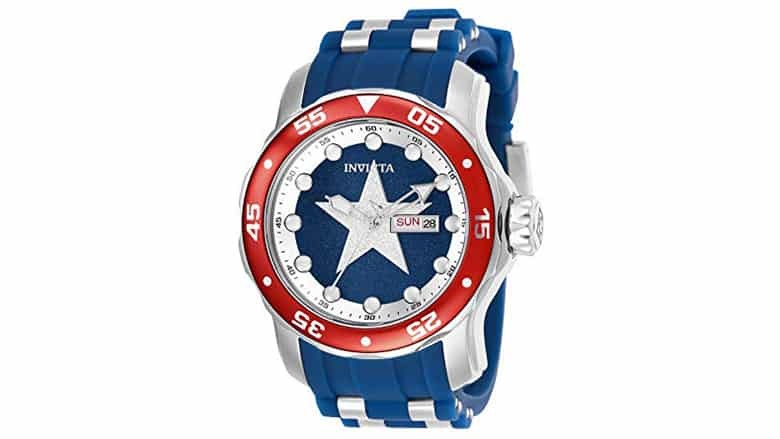 Closing out our list is a similarly attractive watch by Invicta featuring Marvel’s own Captain America. Much like the Superman watch mentioned previously, this timepiece features a design that places Captain America’s iconic shield logo front and center on the watch face, making for a striking appearance while also remaining timeless and subtle. The stainless steel watch body and band, too, give the piece a hefty weight that makes it feel substantial, although the blue and silver color design does feel a little childish. Overall, despite the flaws in the style and feel of this watch, it is by far the best option available for Captain America fans who want to retain a bit of classic fashion sense with their accessories. There’s no cheap nylon watch band on this beauty, unlike the offering by Citizen, and the Japanese quartz movement system makes it that much more sophisticated in its design. For patriots and comic book lovers, you can do a lot worse than this watch. It’s one of the best superhero watches you can buy if you’re a Captain America fan.